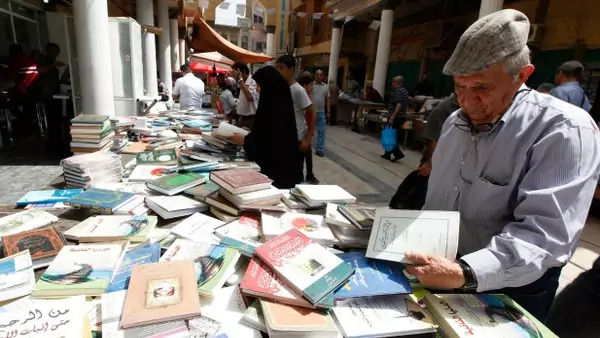 Residents shop for books at Mutanabi Street in Baghdad (Ahmed Saad/Reuters). Reading selections for the weekend of April 28, 2017. Ghaith Abdul-Ahad recounts the Iraqi military's effort to retake control of Mosul's Baghdad Circle, the gateway to the western part of the city, from the self-styled Islamic State. Marcia Lynx Qualey explores the many innovative ways books are being sold and read in Cairo, Baghdad, and Abu Dhabi. Reem Hayat Chayef looks at attempts to revitalize an ancient Jewish neighborhood in the Algerian city of Tlemcen.